The Zohar: It is written of the sinner Bilam: “He walked in solitude… as a viper on the road,” as a snake that crawls alone, and a raven along meandering roads. So Bilam walked in solitude so as to strengthen his spirit of impurity. So it is with every person who walks alone, even in a prominent place, even in a city, in known places, he draws upon himself the spirit of impurity. Hence it is written: “Let not man walk in solitude on a road and in a city” – but only in connection with others, even where people walk and dwell. And also: “Let not man walk alone in the night” – for during that time there are no people. All of this is telling you: Unite with your friends. Kabbalists are saying that you cannot embark on the spiritual path alone. If you want to get on the road, but the road is dark and you can’t see anything because you have no Light (no quality of bestowal, you haven’t yet connected to the spiritual system, to other souls), then you must not leave your “house” alone. You are in the dark because you are alone. You must not take even a single step; it will not benefit you because you’re not yet able to unite with others in spite of your egoism. You must not take even a single step, because this step will not be made in the right direction – toward bestowal, toward love, toward the Creator. First you must unite with others and then come outside. And once you unite with them, you will suddenly see that it isn’t night outside at all, but day. But at night, you shouldn’t embark on a path, even when together, because it means that you haven’t yet achieved the required level of unity. As we see from The Zohar, when night falls, you must hide in a “cave” – the qualities of Bina (bestowal), like Noah in his shelter. Now let us step back and ask: What is the meaning of all this? The Zohar’s aim is not to scare us with creepy stories. Rather, it is a holy book that tells us the correct approach to correcting our souls. We have to open this book with the desire to correct all of these forces within us, all the desires and qualities that we read about. They are all within us. When reading The Book of Zohar we have to remember that “There is none else besides Him” and He Is Good and does Good. This is the only way we should approach our lives and everything that happens in the world. We have to understand that there is only one force behind everything. There is no devil or evil spirits trying to trap us, drag us into hell and roast us on an eternal fire. When The Zohar describes various evil creatures, it is in order to show how a person feels when he reveals the egoistic forces within. He feels as if he is burning in hell and wishes to escape the control of these horrible, dark forces which control him. He sees that they prevent him from advancing towards the Creator, but he cannot fight them and is forced to follow them. The Angel of Death comes to a person and hands him a sword whose tip is smeared with a drop of deadly poison, and the person obeys, opens his mouth and swallows the poison. The Zohar explains that the Angel of Death is our egoistic desire in its final, cruelest form. All of these qualities are inside us and they are killing us. There is nothing worse than this state, even though we don’t realize it. In the wisdom of Kabbalah we study the soul – the sense that reveals the Creator. As a matter of fact, the Creator only created this specific sense, this specific space, and nothing besides it. Right now we also perceive our lives with the same sense, but in a concealed form. This is the reason we refer to our current life as our body, this life, and this world. However, in reality, the Creator only created one desire. And the entire Book of Zohar describes how we can work with this desire in order to recognize the place where we have freedom of choice, where we can work and apply efforts in order to reveal this sense or this desire, and then perceive true life in it. This will not happen without our participation. A person is a small world. The entire world – the universe and everything I see around me – is inside me. All of this only exists within my desire. Therefore, reaching the final correction (Gmar Tikkun) means fully opening my desire to every possible sensation. I have to increase my desire to the maximum, and to feel in it all that there is to feel. That will constitute the end of my correction. Right now I see people, animals, vehicles and stars around me. In reality, they are all my own desires, divided into the still, vegetative, animate and human levels. I have to attach them all to me and feel them within me, in addition to several other worlds that have yet to be revealed to me. I will have to include all of that in my inner perception. Then my reality won’t be separated into internal and external forms; I will perceive it as a single whole. There is only my desire, and nothing else exists. 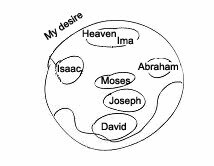 The desire is comprised of qualities called David, Abraham, Isaac, Moses, Josef, the right and left lines, the brook that flows out of the Garden of Eden, Ima, Bina, Paradise above and Hell below, and many others. All of these things exist inside my desire. It is impossible to imagine or think of anything outside the desire because the desire is the Creator’s sole creation. I have to begin to acquaint myself with my desire. Indeed, I live inside of it at this very moment, but I am unaware of that fact. I always use the desire and it, in turn, controls me. My entire life is like a hamster wheel, but I am not even conscious of this. That is why I am studying The Zohar – since it restores me to consciousness. When reading The Zohar, we have to try our hardest to pull away from all the corporeal images that might arise in our imagination. We have to fight the temptation to materialize the concepts, and think about the only created thing – the desire, inside of which there are only two acting forces: reception and bestowal, which come in a multitude of styles. This general desire is separated into many individual desires because it is influenced by the Light, and this influence causes the emergence of various qualities, varying inclinations to bestowal or to reception. Different desires establish different connections among one another, such as opposition, adhesion, or conflict with one another. Yet, we are always talking about our one desire – the only matter of creation, the only thing created by the Creator. The Light influences the desire, and depending on the thickness (Aviut) of the desire, it comprehends the Light’s influence differently and adjusts to the Light. The Zohar tells us precisely about the influence of the Light on the desire, although it usually doesn’t mention the Light as the original cause and only talks about what happens in the desire. It’s the same as how in our world, we see actions or consequences of the Light’s influence, and we treat everything as “that which is taking place,” without relating it to the original cause of the actions. Therefore, we are only talking about the gradations of qualities within the desire. There are no imagined images. When a person begins to read The Book of Zohar, oftentimes he is in a state of “sleeping” and from there he has to start attuning himself to reading and penetrating into the material. Depending on how correct a person’s intention is, how he positions himself, turns himself around and pushes in a particular direction, he will move further in the right direction as he reads the book. Therefore, it is important to tear one’s feelings and thoughts away from all earthly matters and refocus them on the manner in which The Zohar is written. Only one thing was created: the desire to be filled by the Light (the Creator). This desire, inside a person, can be filled by making yourself greater, higher, stronger, and more powerful than other people. Alternatively, the same desire can also be filled outside of you, by fulfilling others. In that case, the more you fulfill others, the more you are filled with the sensation of others’ fulfillment. By measuring this fulfillment inside of you, you yourself are fulfilled. In both cases you use the thickness of the desire, all five levels (or layers) of it, but you either do so for your own sake or for the sake of others. The Zohar tells us about the sensations that are felt in the desire to bestow. The Zohar says that the desire to fulfill yourself is unnatural, because what’s natural is the Creator. The Creator, the quality of bestowal is contrary to the way we have become used to feeling because we were born with this perception. There is nothing in The Book of Zohar that doesn’t exist within my desires. However, I am still unable to find all of it within me. If I gather enough strength to rise to the next degree, then I’m shown exactly what I need to correct. We have already exhausted all the possibilities of egoism, and now we are standing at the threshold of a qualitatively new, altruistic education of the world.